On Monday we went to visit some friends and part of the reason was since they had more garden than they could handle at this time. I am always willing to take free garden goodies it helps feed my family well all year long, (well maybe not okra but about anything else I will take). I show you this because this is a lot of free goodies but it is not just a HUGE amount, it is doable in a day or two. 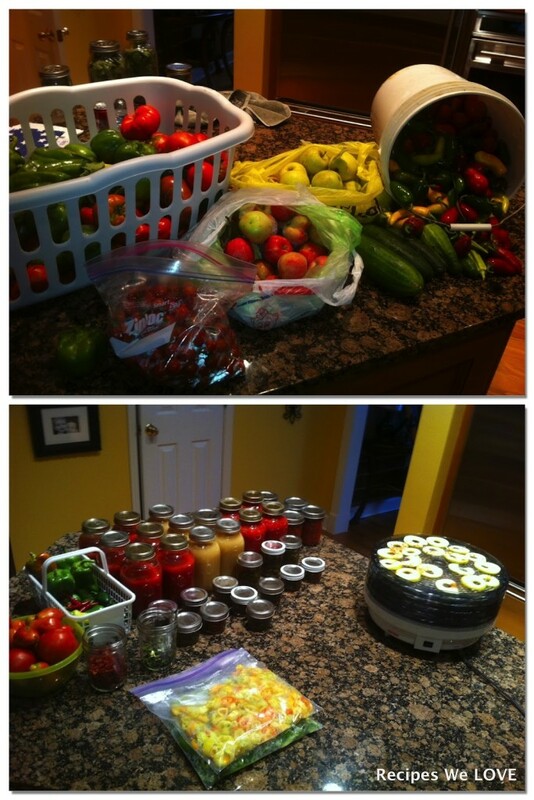 So this is what we came home with, about 5 gallons of Roma tomatoes, 5 cucumbers, gallon bag of cherry tomatoes, about 3 gallons of banana, bell, and jalapeno papers, and 2 grocery bags of apples. Here s what I have done with it this week along with sending a grocery bag full to a neighbor (which is a great way for them to keep me in their minds if they find a source for free goodies). The Green bowl on the left are tomatoes that are not quite ready yet or that I am saving to eat on the next couple of days. The white basket is full of peppers for Meat Loaf Stuffed Peppers for dinner one night, and for some Bacon Wrapped Jalapenos for another dinner. Then I did some canning 6 quarts of tomato juice, 5 quarts of apple sauce, 4 quarts of Diced Tomatoes, 5 pints of Bruschetta Mix, and 13 jelly jars of Candied Jalapenos which are great for parties or gifts. The plastic bags are full of banana peppers, and bell peppers Ready for the Freezer. Then I put my dehydrator to use, the jars without the lids have dried cherry tomatoes, and dried bell peppers, then I have 5 trays of apple chips going right now on the dehydrator . 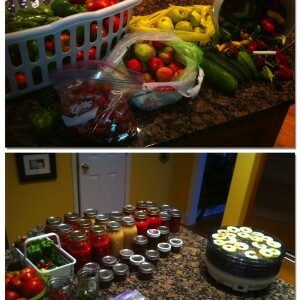 So for a just a little drive time I have lots of great food for my family.